PoSAT-1, the first Portuguese satellite, was launched into orbit on September 26, 1993, on the 59th flight of the Ariane 4 rocket. The launch took place in the Kourou Space Centre, French Guiana. About 20 minutes and 35 seconds after launch, at an altitude of 807 km, PoSAT-1 separated itself from the rocket. The PoSAT-1 weighs about 50 kg and belongs to the class of microsatellites, which are between 10 and 100 kg. The entire project was developed by a consortium of universities and companies in Portugal and was built at the University of Surrey, UK. Earth Imaging System (EIS) – consisting of two charge-coupled device (CCD) imagers, two lenses, and a Transputer Data Processing Experiment to provide on-board image processing and data compression. One imager had a wide field of view with 2 km ground resolution; the second narrow field imager provided 200 m ground resolution. Star Sensor – based on the same technology as the EIS but was optimized for imaging the faint light from stars for use as part of the spacecraft’s attitude determination system. The star-field image was analyzed by the Transputer Data Processing Experiment and the resulting measurement data returned to the on-board computer. GPS Navigation Experiment – PoSat-1 carried a Global Positioning by Satellite (GPS) receiver based on the Trimble Trans-II receiver. The received data was decoded and filtered by the Transputer Data Processing Experiment and provided the satellites position and velocity as well as an accurate on-board time reference. 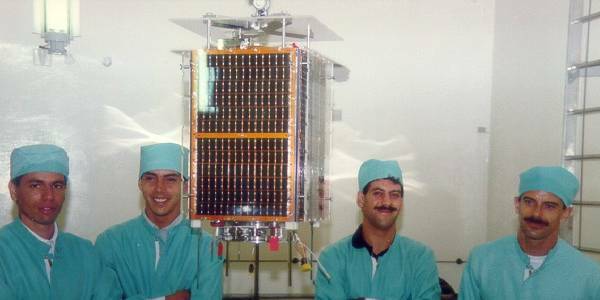 This enabled the satellite to generate its own orbital element set, provide scheduling and synchronization to other computers, and allowed ground stations equipped with a GPS receiver to experiment with applications for real-time differential GPS data. Cosmic Ray Experiment (CRE) – the CRE monitored the space radiation environment experienced in orbit by the satellite and enabled analysis of its effect on spacecraft semiconductor electronics. The CRE contained a PIN diode and multi-channel analyzer capable of detecting energetic particles with a wide range of Linear Energy Transfer to build up a spectrum of observed energies of particles within the spacecraft. Special RADFET’s were also incorporated to monitor the accumulated ionizing dose. The larger memory devices in the on-board computers were regularly “washed” to detect and log Single Event Upset (SEU) information. Digital Signal Processing Experiment (DSPE) – consisted of two Texas Instruments processors from the TMS320 series, the C25 and C30. 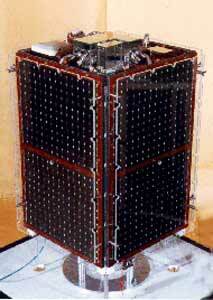 The DSPE was used as a programmable communications modem to modulate downlink data from or demodulate uplink data for the OBC thus enabling experiments with new modulation techniques optimized for Low Earth Orbit satellite mobile communications. Store and Forward Communications – the main spacecraft On-Board Computer (OBC), based on an 80C186 8MHz processor with 16 MB of SRAM, also supported digital store and forward communications using AX25 packet protocols and communications links optimized for communications using very low cost, simple and portable ground stations. The design took advantage of the latest research developments undertaken at UoSAT/SSTL – including high data rate modems at 38.4 kbps data rate and a new synthesized transmitter design.